↑ phoneme (Lexicon of Linguistics) (en). Universiteit Utrecht. 访问日脚2014-11-03. 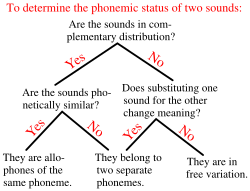 ↑ What is a phoneme? (en). SIL International. 访问日脚2014-11-03. ↑ 何謂音位學 (zh). 輔仁大學語言學研究所. 访问日脚2014-11-03. 苏诚忠 (2005-11-30). 音素phoneme. 《语言个本质》. 语言文字网. 访问日脚2007-02-16.